This entry was posted on February 8, 2013 at 12:30 pm and is filed under 1979, Heavy Metal, Music, Rock, Uncategorized with tags AC/DC, Classic Rock, hard rock, Heavy Metal, Heavy Rock, Highway to Hell, The 1970s. You can follow any responses to this entry through the RSS 2.0 feed. You can leave a response, or trackback from your own site. Ahhhh YEAH! Amazing album. Not one weak song! For me personally, I prefer earlier albums — I like Dirty Deeds and High Voltage best — but you can’t go wrong with this one. Very cool, I agree what kind of record store is it that doesn’t let you play AC/DC? 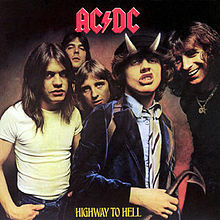 “I like the earlier albums like the ones you mentioned, especially the live “If You Want Blood You Got It.” However, it was Highway to Hell that got me into AC/DC big time. What kind of record store? A lame one I guess! I could only play this stuff when no bosses were around. I love Bon Scott. RIP! Definitely a lame one, ha. The one weakness with Hell’s Bells is the lead singer can’t achieve Bon Scott’s or Brian Johnson’s vocal range with consistency. He is getting up in years though, but I’ll see what transpires tonight. RIP Bon Scott! Hell even Brian Johnson can’t achieve that with consistency! It’s not an easy style to sing! “Touch Too Much” may quite possibly be my #1 favorite AC/DC song of all-time. Really. I’m serious. The song flat out ROCKS! Touch Too Much at number one, that’s nothing to be ashamed of, that song rocks! For me though it’s only number three behind the title track and You Shook Me All Night Long. I wouldn’t have ever left this one out.